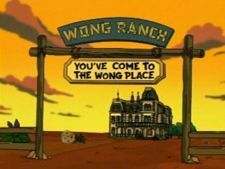 Wong Ranch is the home of the Wongs. The ranch hold contains a massive herd of Buggalo. The Wongs stamp everything that doesn't belong to them instead of stamping what does belong to them. The ranch was built on land taken from the Native Martians and is the pride of their land, which includes the entire western hemisphere of the planet. 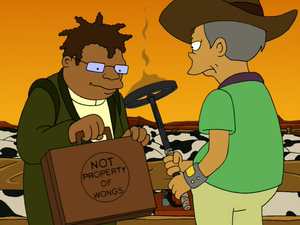 The Martians wanted to trade the ranch and all of the Wong land for Amy Wong. The ranch in 17.9 billion acres, an accurate account of half of Mars' acreage. Corn, another resource of the ranch, is rolled out fully grown, much like sod. The Wong house looks like the Victorian mansion of the Reata ranch in the 1956 film Giant. This page was last edited on 15 September 2017, at 00:02.